A salt, in chemistry, is any ionic compound composed of cations (positively charged ions) and anions (negative ions) so that the product is neutral (without a net charge). These component ions can be inorganic (Cl−) as well as organic (CH3COO−) and monoatomic ions(F−) as well as polyatomic ions (SO42−); they are formed when acids and bases react. There are several varieties of salts: Normal salts are those that do not contain a hydroxide ion (OH−) or a hydrogen ion (H+). Salts that contain a hydroxide ion are basic salts and salts that contain a hydrogen ion are acid salts. Impure salts is a name for salts which have lost their saltiness, and can also refer to natrons. Zwitterions are salts that contain an anionic center and a cationic centre in the same molecule; examples include amino acids, many metabolites, peptides and proteins. When salts are dissolved in water, they are called electrolytes, and are able to conduct electricity, a property that is shared with molten salts. Mixtures of many different ions in solution—like in the cytoplasm of cells, in blood, urine, plant saps and mineral waters— usually do not form defined salts after evaporation of the water. Therefore, their salt content is given for the respective ions. Salts can be dehydrating to the human body if consumed in excess. The first registers of salt use were produced around 4000 B.C. (roughly) in Egypt, Greece and Rome. Salt was very valuable and used to preserve and flavor foods. In Ancient Rome, salt started to be used as money originating the current Latin-derivative term salary. Unfortunately for those paid with salt, it was easily ruined by rain and other factors. Payments to Roman workers were made in salt. Salt was also given to the parents of the groom in marriage until the 8th century. The Phoenicians were the first people to harvest salt from the sea. They sold it to other civilizations and most of the time it cost more than gold . The Phoenicians were victims of their success and as a result of harvesting the salt from the sea, the value of salt depreciated. The Phoenicians harvested the salt by flooding plains of land with seawater, then leaving the plains to dry. After the water dried, the salt which was left was collected and sold. Salts are usually solid crystals with a relatively high melting point. However, there exist salts that are liquid at room temperature, so-called ionic liquids. Inorganic salts usually have a low hardness and a low compressibility, similar to edible salt. 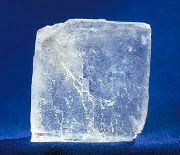 Salts can be clear and transparent ( sodium chloride), opaque ( titanium dioxide), and even metallic and lustrous (iron disulfide). Salts exist in all different colors, e.g. yellow (sodium chromate), orange ( potassium dichromate), red ( mercury sulfide), mauve ( cobalt chloride hexahydrate), blue ( copper sulfate pentahydrate, ferric hexacyanoferrate), green ( nickel oxide), colorless ( magnesium sulfate), white ( titanium dioxide), and black ( manganese dioxide). Most minerals and inorganic pigments as well as many synthetic organic dyes are salts. Different salts can elicit all five basic tastes, e.g. salty ( sodium chloride), sweet ( lead diacetate ), sour ( potassium bitartrate), bitter ( magnesium sulfate), and umami or savory ( monosodium glutamate). Pure salts are non- volatile and odorless, while impure salts may smell after the conjugate acid (e.g. acetates like acetic acid ( vinegar) and cyanides like hydrogen cyanide (almonds) or the conjugate base (e.g. ammonium salts like ammonia) of the component ions. The name of a salt starts with the name of the cation (e.g. sodium or ammonium) followed by the name of the anion (e.g. chloride or acetate). Salts are often referred to only by the name of the cation (e.g. sodium salt or ammonium salt) or by the name of the anion (e.g. chloride or acetate). A base and an acid, e.g. NH3 + HCl → NH4Cl. A metal and an acid, e.g. Mg + H2SO4 → MgSO4 + H2. Salts can also form if solutions of different salts are mixed, their ions recombine, and the new salt is insoluble and precipitates (see: solubility equilibrium).